Although weather forecasters cannot predict exactly the severity of the 2012 hurricane season, the current La Nina may have an effect during the early part of the season. Disaster Relief Supply recommends keeping a close eye on any storm in the Atlantic this coming hurricane season. It has always been a crap shoot for a meteorologist to predict a long term forecast for hurricane development. Although new weather satellites and computer modeling assists in the forecast, 100% accuracy is still a future goal for our weather forecasting scientists. What meteorologists have learned is that certain weather patterns “may” affect major storms both in intensity and in direction of the storm. To stay current, even the best computer models require daily updates of jet streams, prevailing climate conditions, and water temperatures. The La Nina phase has been active for the past 2 years and is predicted to end mid-2012. During a period of La Niña (http://www.artemis.bm), the sea surface temperature across the equatorial Eastern Central Pacific Ocean will be lower than normal by 5-9 °F (eaglevalleynews.com). The cooling of the surface alters the weather patterns in both the Atlantic and the Gulf influencing the strengthening of storms coming across the Atlantic. La Nina also brings an overall larger number of hurricanes. Category 3 (sustained winds of at least 111 mph) hurricane frequency is above average, and the possibility of the hurricane reaching land is also above average. Disaster Relief Supply, a leading retail provider of emergency preparedness supplies, recommends checking with the National Hurricane Center whenever a storm is reported brewing in the Atlantic. 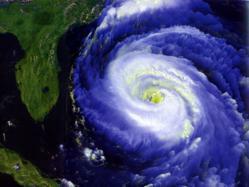 Knowing when and where a tropical storm or hurricane will strike can save property and lives. For residents of coastal waters, being prepared is more than a motto, it is a reality.